It was a gorgeous evening. Leaves blown into the street, jack-o-lanterns flickering on porches, and afternoon sunlight warming the air just enough to trick-or-treat. You know I love Halloween. I say it every year. And every year I think, maybe I won’t love it as much. Maybe the candy overload will derail me. Maybe I’ll decide it lasts too long. (A whole week of costuming for lessons, parties, and other events can do you in, right?) Maybe I’ll opt for Thanksgiving with its meaning and simplicity, which I do love. But I don’t. Halloween still remains my favorite. I love the sense of community, the fun costumes, the chance to be something new, the kids at my door, the autumnal light, the crackle and scrape of leaves underfoot, the earthy smell, the way the sky looks, the bit of cold in the air, and nature’s unbelievable color. So here they are. Liza as Dorothy. Ali as French Country Belle (Emma Watson version). Sami as a Crazy Cat Lady. Sam refused to wear her curlers trick-or-treating due to a big hair debacle at school with all kinds of torturous untangling – apparently it took Ali and a bunch of friends 15 minutes in the girls’ bathroom to get them out. Spencer as a Roman Gladiator, and Gordy as a Robber. And look at those leaves over Betsy’s bridge! These two. Katherine and Eliza. They are the dearest of friends. Kara and I say all the time how lucky they are to have each other. Dorothy and Toto. Toto looks more like a rat. Or a furry cat without whiskers. But along he went in the basket. And thanks to my sister Deb, for the amazing Dorothy dress. Belle and her book. I thought Ali was the perfect fit for this costume. Sami LOVES cats. Despite the fact that most of us are allergic. She saw this idea online and re-worked it per her style. Cat everything. Slippers, leggings, shirt, glasses. And we got a total kick out of sewing all those little cats onto her bathrobe. Grandma Nae’s curlers though. They made the costume! and decapitating! Never a straight face, this one. Skinniest, scrappiest little robber I’ve ever seen! 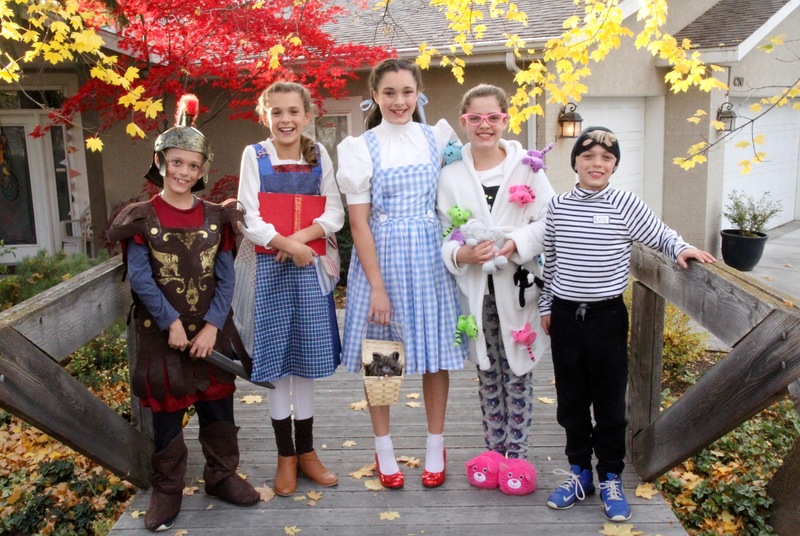 We had Eliza’s neighborhood friends over for soup and breadsticks before trick-or-treating. They were so polite and gracious. I’ve taught most of them twice now in sunday school and I love them all. They are good, thoughtful girls. And they pulled a great crazy photo. The light that night was spectacular. Ali and Sami’s BFF, Lydia, came to join as well. She cracks us all up. I hope our home is always full of good friends. I want it to be a place they always feel welcome, that they like to come. While I’m sad to see my boys growing up so quickly, I’m looking forward to the teenage years, of laughing with these kids and their friends in our kitchen, cheering them on in all they choose to do. And almost a full moon! Last pics are from our neighborhood party at the Fredricks. Always a great time! The kids have been begging me for years to coax my awesome bed head into a mad scientist costume. Well, this was the year. And 😂 I won a prize for my costume! I never win a prize! Truth be, I think the costume suited me a little too well. It’s how I feel most days, even when I do comb that hair down. Such AMAZING costumes!! Wow! I absolutely LOVE the creativity. Your mad scientist is amazing. I can’t believe how grown up your kids are. Looking at how tall they are as they’re standing next to you! I’m with you. I totally love Halloween. So many fun memories to make. Your home will totally be a place the friends and teens will want to gather. You have filled it with love. Anne Marie, your continued and watchful love is a true gift to me. I have thought about your last text to me often and I am sorry I have not yet replied. I wanted to write something to you on paper. My apologies that I am so slow. Watch the mail. I’m hoping to have something in the post by next week. Hoping your missionary boy is still doing well. And the rest of your handsome sons. And that you are feeling well. I’m sad we couldn’t connect in person this summer. Next, please? Love you dearly!